For musicians who grew up in the last half of the 20th century, the words “48th Street” conjure up vivid memories of the epicenter of NYC’s robust music industry. The Big Apple’s Music Row was a cluster of instrument retailers along West 48th Street between Sixth and Seventh Avenues, which could service the needs of literally every musician on the planet. World-famous legends, touring sidemen, local session cats and working pros, music teachers, garage band amateurs and beginners, and tourists from around the globe; they could all come to 48th Street and find the tools they needed to bring the music in their hearts to life. After weathering cultural and stylistic changes from the big band era to late-‘90s electronica, the shops slowly faded away as brick-and-mortar retail gave way to 21st-century e-commerce. But an entire generation of musicians continues to cherish their memories of Rudy’s, We Buy Guitars, Alex Music, and others as essential elements of this city’s rich cultural history. The guitar is rightfully poised to enter the Rock and Roll Hall of Fame, as part of an upcoming Manny’s-themed exhibit. Ian Goldrich, Manny’s grandson, is both humble and proud of his family’s legacy. “I said to the curator of the hall,” explains Ian, “‘I understand why The Who and Jimi Hendrix are in there, but I’m not quite understanding why you’d want to do something about Manny’s.’ To which the curator replied, ‘We’re not just a museum. We’re here to educate people. And the Manny’s story and the music history of New York is really important to how we’ve gotten to where we are and why the Hall of Fame is what it is.’” That story continues to unfold today, as the heirs to Manny’s Music have now joined forces with former 48th Street neighbor and competitor Sam Ash. But let’s not get ahead of ourselves. “You gotta understand,” Fred continues, “rock and roll was not electric guitar-driven at that point; nobody thought of Buddy Holly as a ‘guitar hero,’ you know what I mean? But now you’ve got a unit where everybody’s equal, and everybody’s got 25% of what makes the song the song. Plus you saw these flashy guitars, solos…it was guitar-driven, and the kids went wild.” Ian Goldrich confirms: “The Beatles kicked it up a big-time notch. It made certain companies; I mean, look at Rickenbacker! They really took advantage of that whole thing. Henry routinely purchased used instruments for resale, and on this day a person (or persons, details are sketchy) brought in a full set of instruments repainted with new, bright colors. Among them was an unremarkable Danelectro guitar that had been painted bright yellow. “It wasn’t a factory color,” Ian says. “In fact now that the guitar has aged, you can see it probably came from the factory as black. It had this little lipstick pickup in it, all stock parts, just the color was different. 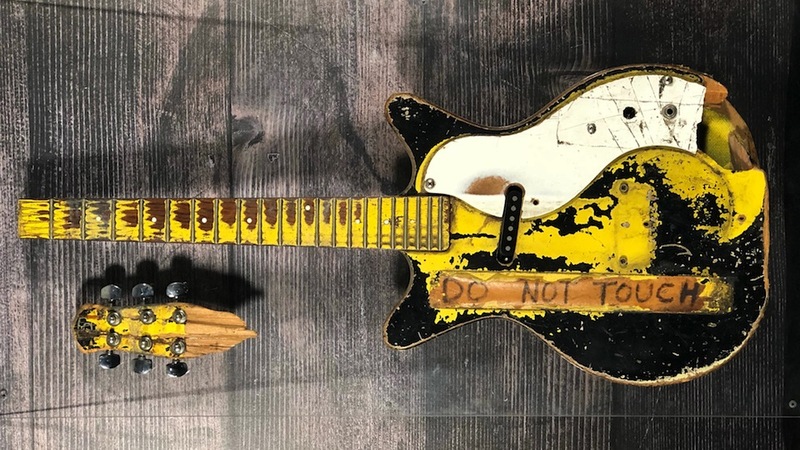 So it was an off-the-street buy; it didn’t come from the company.” The other repainted instruments were eventually sold, but “the yellow guitar” hung around. By this time Henry was well-known for his strict policy of forbidding customers to try out new guitars unless they were serious about buying them. NYC guitarist Jack Morer, a Manny’s employee in the mid-80s, remembers his own shopping trips there years earlier: “As a kid, you’d come into the city, and you’d go to Manny’s and say ‘Hey can I play that guitar?’ And someone would always be asking you ‘Are you buying today?’ And they were always really impatient.” Ian concurs: “Listen, 48th Street was not an easy place to buy an instrument. It was intimidating, and it was New York at its finest and worst depending on how you consider it, you know? If you walked into Carnegie Deli, those waiters were not all warm and fuzzy. And that’s kind of how 48th Street was: it was ‘Show us your money, kid!’ It didn’t start on 48th Street but we were certainly a part of it.” Henry’s “show us your money” approach was fair enough; no shopkeeper wants his wares damaged pre-sale. But where did that leave customers looking to test out new amplifiers or effects pedals, who actually needed a guitar to play? Eventually, however, “Old Yellow” met an abrupt end of sorts. “It fell off a guitar stand and the headstock broke off,” Ian says. “That was the end of that.” Despite being damaged beyond repair, the guitar remained in a glass display through the ‘80s and ‘90s as a totem of years past. But as the ‘90s wore on, the tide began to turn for Manny’s. Because of shifting economic factors better explained elsewhere, Manny’s officially closed its doors in 2009. Photo Credit: Image of Old Yellow by Max Ash courtesy of Sam Ash Music Corp. I was in Manny’s probably around the late 80s just before I married my wife. Had to take her to the skating rink there that’s 30 Rock but I wanted to make a stop on Music Row. Got to go in to Manny’s for about an hour or so and one of the first things I saw was some of the pictures on the wall as you go up the steps one of Jimi Hendrix. So amazing to be part of History it’s sad though that the history is over. Farewell Manny’s you will be missed you helped many of us become the musicians that we are today thank you and God bless you. AH yes, Old Yellow. When I first started playing back in 1967, Manny’s and”We Buy” were always a stop for me. The lure if hoping to see someone famous was too great. And I was rewarded. I remember seeing Hendrix in the old store, Paul Simon and Leslie West too. So when I finally had the bucks in the spring of 1972, I made my way to Manny’s and bought a used Sunn Solaris. But of course before buying, I had to try it out using old yellow. I always treasured the thought that all of the guitar greats, that I looked up to and were influenced by played that that thang. I only hope there’s still a little of my sweaty DNA is still there. I bought my first guitar, a Guild Starfire III, at Manny’s (at 120 W. 48th) in 1961. I still have the instrument, and it still plays beautifully. During the mid-70’s I spent way too much time in the various shops on 48th. By that time they had moved to 156. I never remember being asked if I was going to buy today, in my memory (at least) you could play any guitar. And you might be playing alongside a top musician. Sam Ash was right next door, and was probably my most-frequented hangout. Across the street at We Buy Guitars I bought a Fender in the mid-70’s. Some years later I went to Manny’s to buy a recording deck, and was told that I had to go to the Brill Building to buy it. Imagine buying musical merchandise from Manny’s in the Brill Building. Almost like being in church. Recorded a demo around the corner at Nola Studios. Great times, great memories. Looks like the old yellow guitar needs to be thrown out! And if it’s ever found, throw out Christ’s chalice. Just an old cup…. Evidenty your wiring is crossed and you just don,t get it. Or your the new me generation. The neck can be repaired and it isn’t that tough to do. It could be back in service in 3 days, tops. I purchased my first guitar back in 1964 at Mannys, it was an Epiphone. Biggest memory – saw Ringo/s drum kit with the Beatles logo on it – and was able to take a photo with it. Left NYC in 1967, then back in 2014, for nostalgia, wanted to visit Mannys but alas only the storefront and worn out sign remained. A great treasure in the Rock Hall, indeed. Hey what ever happened to Buddy Rich’s drums? They used to be up on the wall in Manny’s after he passed away. Periods. Comma,s , will do. We,re not writing a novel. Not everyone needs to be an “English Major” to relate their experience. Try being humble. Salespeople with attitudes, you can’t try the guitars, gee I wonder why they’re no longer in business! I went to Manny’s often when I lived in the city and usually felt worse coming out than I did going in. Thanks for the article, Mr. Montagna! I’m a big fan of your YouTube videos, especially the Beatles Remasters videos. I hope you’ll post one about the 50th Anniversary White Album box set. I bought my first decent guitar, a Guild D-40, at Manny’s back in the ’70s. Still have it, albeit it has a little wear. LOVED Manny’s. I lived in Denver, but visited NYC and bought two Telecasters from them in the mid 80s. A pink paisley reissue, and the Rosewood “George Harrison” reissue. Just walking in the door of that place was like stepping into a shrine. 2009 was a bad year. For Christmas 1989 my father asked me to make a Christmas list, but with no CDs on it. It was all I’d been asking for for birthdays and Christmas for a few years. So, I put a couple of small items I could use, then added, as a joke, “A Rickenbacker 4001 bass like in the Rush poster over my bed at home.” I was on college. I came down the stairs Christmas morning and saw a large rectangular wrapped object. I knew what it had to be. A blue 1978 Rick 4001. $895, from Manny’s. My father never thought I liked it because, for one of the rare times in my life, I was speechless. 2009. In March, I lost my father to complication from cancer treatments. In May I got sick and missed a lot of work. I had no insurance or benefits and worked commission, so I was out a lot of money. 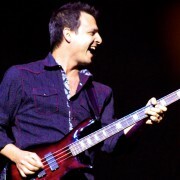 I had one item of value and sold the bass to Norman’s Rare Guitars in Los Angeles for $900. The Sunset Strip was selling a 1978 blue 4001 for $3200. I had no time for e-bay. It was the only time I was glad my father had died as he wouldn’t see me sell this gift. And apparently Manny’s went away that year as well. I was only in Manny’s once in the late 1980s. I don’t remember much. I can’t believe it’s been 10 years since all that happened.